There’s a hidden bungalow perched on a hill in Kamshet, and you need to spend your weekend there to actually realize how spellbinding it is. 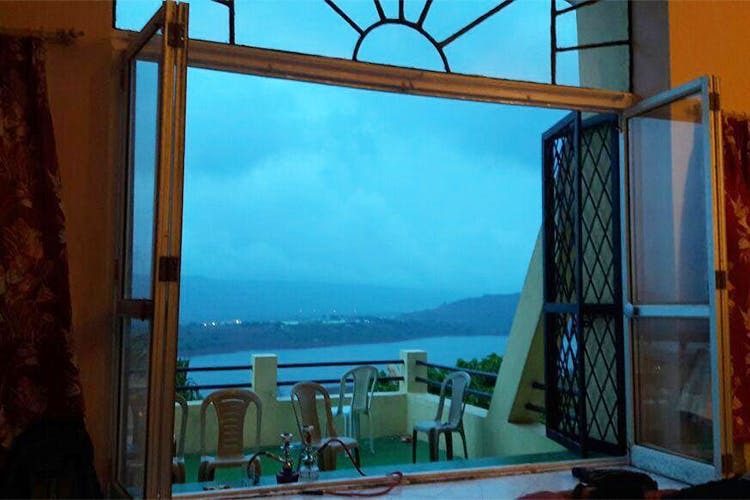 Sondela, the two BHK bungalow in Kamshet, promises an exclusive stay, cut off from the rest of the hotels and populated areas, and overlooking a scenery right out of our childhood drawing books, complete with a lake and ranges of hills bordering it. The bungalow serves as the perfect place to chill with friends, or even family, after a long, hectic week which left you striving to get away from society and civilization for a while. You can either cook at the bungalow, or order food from the restaurant nearby. Being 30 km from Lonavala, Kamshet is also the home for adventure sports that you can never get tired of, and at the end of the day, there’s nothing better to welcome an exhausted you than the spectacular view of the Vadavali lake and the distant hills. This beautiful haven, tucked away amidst the lap of nature, comes at a really reasonable price of INR 7000 per night, for six people. It can accommodate up to 15 people, and an extra person is charged INR 1000 per night. This bungalow has received splendid reviews from people who have been fortunate enough to experience it, so you better buck up if you want to spend some time here (the officials receive booking offers all throughout). Monsoon’s coming and we all know how breathtakingly beautiful it gets up there in the Western Ghats, during the rains. You can book the bungalow for as many days as you want, by calling +919920688802. Alternatively, you can message them on their Facebook page right here.